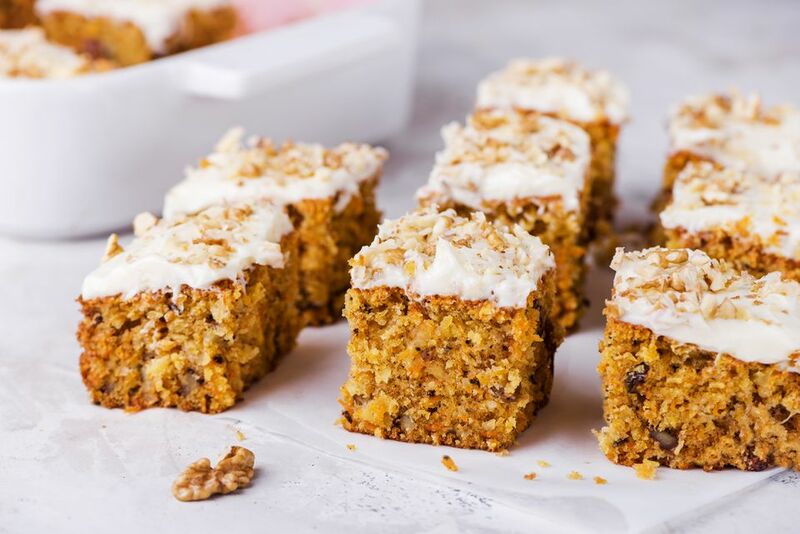 Carrot cake gets its moisture from finely-grated carrots, which also add natural sugar, fiber, and nutrition to your sweet treat. This carrot cake recipe includes tropical elements with coconut and pineapple. If you miss the raisins more commonly found in carrot cake, you can vary the recipe and include them. In fact, soaking them in rum for an extra kick pairs nicely with the "island" flavors. The cake is baked in a single layer in a rectangular pan, although you can vary that as well. You can use the batter to make mini-bundt cakes, mini-loaves, or giant muffins. You should reduce the baking time to 25 to 30 minutes for smaller loaves. The cake is finished with a smooth, creamy cream cheese frosting and chopped pecans or walnuts. Or, garnish the frosted cake with toasted coconut. If you are sensitive to nuts, you can leave them out of the recipe. Note: while there are multiple steps to this recipe, this carrot cake is broken down into workable categories to help you better plan for preparation and baking. In a mixing bowl, combine the flour, granulated sugar, salt, baking soda, cinnamon, and nutmeg; stir to blend thoroughly. Add the eggs, vegetable oil, shredded carrots, and 2 teaspoons of vanilla; beat until well blended. Stir in the well-drained pineapple, coconut, and 1/2 cup of the chopped walnuts or pecans. Bake in the preheated oven for 45 to 55 minutes, or until a wooden pick or cake tester inserted in center comes out clean. Place the pan on a rack to cool completely. In a mixing bowl with an electric mixer, beat the butter and cream cheese together until smooth and creamy. With the mixer on low speed, gradually beat in the powdered sugar. Add the 1 1/2 teaspoons of vanilla and beat on high speed until smooth and creamy. Frost the cooled cake with cream cheese frosting and sprinkle with the remaining chopped nuts. Lightly press the nuts into the frosting. Be sure that the carrots are very finely grated, preferably using a microplane grater or zester. You may not get them grated finely enough if you use a food processor or regular grater. You can omit the nuts in the cake or as a garnish for the frosting, if desired. Toasted coconut makes a lovely garnish. Raisins are an optional addition. Soak them in warm water for 15 minutes and drain before adding them. Soaking them in rum is another variation.